Plants have the impressive abilities to reproduce asexually and regenerate damaged parts. The secret to these abilities lies within a tissue type called meristem. Meristematic cells are fully developed and functional at maturity, but unlike other cells in the plant, they remain totipotent. This means that when induced, they can develop into any specific plant tissue at any point during the life of the plant. Other cells in the plant are fully differentiated (meaning that they are specialized in both form and function) and do not divide. Cells in the meristem, however, divide and produce all of the new cells in a plant. While meristem tissue is the source of the regenerative potential of a plant, meristems also play a pivotal role in normal plant growth. Plants have the unique ability to continue to grow and develop new organs while functioning as a mature, reproducing organism. Plants grow larger via cell division and cell elongation. Simple plant growth is facilitated by meristem tissue because it is the primary site of cell division (mitosis) in the plant. Plants develop new organs (stems, leaves, flowers, roots) via cell division and cell differentiation. Because the source of all new cells in a plant is the meristem, this tissue plays an important role in organ development as well. While some of the cells of the apical meristem divide to generate new meristematic cells, most of the offspring cells differentiate into specialized cell types that stop dividing and function as a part of the organ in which they were generated. Plants have meristematic tissue in several locations. Both roots and shoots have meristematic tissue at their tips called apical meristems that are responsible for the lengthening of roots and shoots. The shoot apical meristem is formed during embryonic development, but after germination gives rise to the stem, leaves, and flowers. The root apical meristem is also formed during development, but during germination gives rise to the root system. Cell division and cell elongation in the apical meristem is called primary growth and results in an increase in plant height and root length. 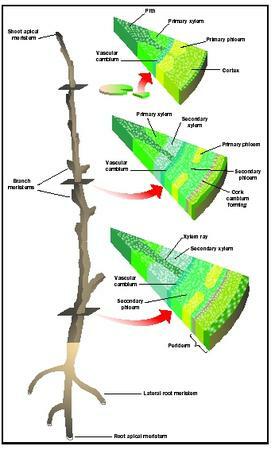 Increasing root length enables the plant to tap into the water and mineral resources of a new region or layer of soil. Increasing shoot length makes the plant taller, thus allowing it better access to sunlight for photosynthesis. Many types of plants also increase the diameter of their roots and stems throughout their lifetime. This type of growth is called secondary growth and is the product of lateral meristem. Lateral meristem is called the vascular cambium in many of the plants in which it is found. Secondary growth gives a plant added stability that allows for the plant to grow taller. Lastly, some plants have intercalary meristem. These are areas of plants that help in the regeneration of parts of the plant that have been damaged by predators or the environment. Intercalary meristems produce growth at the base of grass blades, for instance. Meristem tissue is not autonomous. Throughout the life of the plant, the rate of cell division and cell elongation in the meristems is regulated by plant hormones . For example, giberellins stimulate cell division in shoot apical meristem, causing the plant to grow taller. These hormones also cause cell elongation in intercalary meristem of grasses. Cytokinin and auxin are also important growth regulators. Auxin stimulates growth by inducing cell elongation, while cytokinins are thought to stimulate both cell division and cell elongation. Meristem locations, with cross-sections of vascular tissues. As the source for all new cells of the growing plant, the meristem plays an important role in the formation of new organs and in the correct placement of those organs within the plant body. The process by which this organization happens is called pattern formation and, in plants, is directed by the meristem. To accomplish this task, meristematic cells must be able to interpret their position in the plant and establish a certain fate. For example, during the development of a new leaf, the dividing cells of the meristem must differentiate into several different functional types of epidermal cells and parenchyma cells. However, they do not need to differentiate into reproductive cells like those found in a flower. How is it that meristematic cells "know" what to become? The actively dividing cells of the apical meristem use positional cues such as hormones and cell-cell interactions as guides during differentiation. Moreover, these positional cues result in the activation of certain genes and the inactivation of other genes in a set of cells, thus initiating their specific differentiation pattern based on their spatial location in the plant. The specific genes that are initially activated in meristem cells during this process are called homeotic genes. These genes encode a family of transcription factors that, once activated, will determine the fate of a cell by activating and inactivating a whole host of other genes. One mechanism of differential gene expression (the activation and inactivation of genes during differentiation and organ development) is binding of plant hormones to the developing cell's surface. Hormones such as cytokinins have been shown to affect ribonucleic acid (RNA) transcription and translation . It is thought that the presence of both cytokinins and another class of hormones, called auxins, are important for proper root and shoot development. In the laboratory, if a set of undifferentiated meristem cells are grown in culture, they will not develop into a plant embryo unless they are stimulated with auxin and cytokinin. A high cytokinin/auxin ratio will stimulate the meristematic cells to develop stems, leaves, and flower buds. On the other hand, a high auxin/cytokinin ratio will stimulate the meristematic cells to develop roots. Fletcher J. C., and Elliott M. Meyerowitz. "Cell Signaling Within the Shoot Meristem." Current Opinions in Plant Biology 3 (2000): 23–30. Meyerowitz, Elliott M. "The Genetics of Flower Development." Scientific American (November 1994): 56–65. Moore, Randy, W. Dennis Clark, and Kingley R. Stern. Botany. Boston: William C. Brown Publishers, 1995. Salisbury, Frank B., and Cleon Ross. Plant Physiology, 4th ed. Belmont, CA: Wadsworth, Inc., 1992. Van Overbeek, J. "The Control of Plant Growth." Scientific American 219 (1968): 75–81. what are the types of meristems?